Illustrated obscurity: Teddy Roosevelt was a badass. Teddy Roosevelt was a badass. While Roosevelt was campaigning in Milwaukee, Wisconsin, on October 14, 1912, a saloonkeeper named John Schrank shot him, but the bullet lodged in his chest only after penetrating his steel eyeglass case and passing through a thick (50 pages) single-folded copy of the speech he was carrying in his jacket. Roosevelt, as an experienced hunter and anatomist, correctly concluded that since he was not coughing blood, the bullet had not completely penetrated the chest wall to his lung, and so declined suggestions he go to the hospital immediately. Instead, he delivered his scheduled speech with blood seeping into his shirt. He spoke for 90 minutes. His opening comments to the gathered crowd were, "Ladies and gentlemen, I don't know whether you fully understand that I have just been shot; but it takes more than that to kill a Bull Moose." Afterwards, probes and x-ray showed that the bullet had traversed three inches (76 mm) of tissue and lodged in Roosevelt's chest muscle but did not penetrate the pleura, and it would be more dangerous to attempt to remove the bullet than to leave it in place. 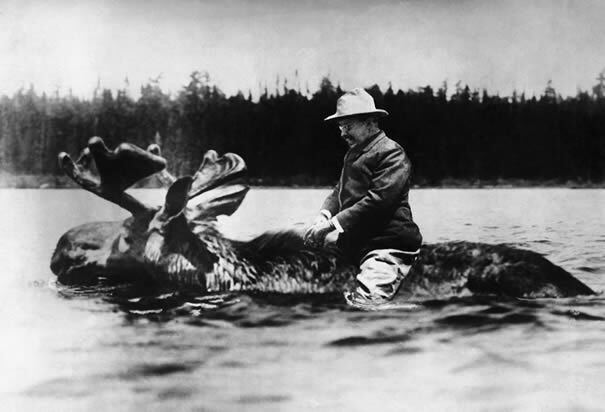 Roosevelt carried it with him for the rest of his life. TR was the youngest president in history, coming to the office at the age of 42 after the assassination of President McKinley. He was the first president to win a Nobel Prize. Roosevelt appointed Oliver Wendell Holmes to the Supreme Court. He invented the term "muckraker".